When you have a big family, it can be hard to properly manage your finances. 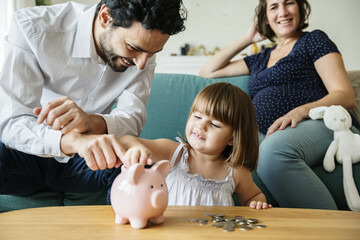 Here are some tips on how to create a proper family budget. Saving money isn't easy. This is a challenge we all face. No matter how many hours you work each week, there never seems to be enough money to cover everything. One of the best ways to make the most of every dollar you earn is to create a family budget. You'd be surprised how much difference it can make to take the time to sit down and crunch the numbers. In this article, we take a look at the steps you need to make a budget that is easy to follow. Keep reading to see how simple it can be to come up with a plan to keep more of your paycheck. It can be exhausting working hard every week to watch your money evaporate into thin air. This can make it feel like you're spinning your wheels but not getting anywhere. As with anything else in life, the key to making progress is to have a plan. You set goals in other parts of your life, such as fitness, career, spending time with family, or losing weight. So why not have financial goals as well? Financial goals give you something to aim for. And once you have a target, you can create a strategy for hitting that target. Creating a budget is a simple matter of adjusting your spending habits to make the most of your income. To do this, you'll need to gather your bank statements and take an honest look at the amount of money you're spending each month. This is the stage where you need to make some tough decisions. After all, it's going to soon become obvious where money is being wasted. The good news is that once you see where the money is going, you can make adjustments. Cut back on unnecessary costs and learn to enjoy saving money more than spending it. There are obviously unavoidable costs associated with everyday life, but you'll be amazed at how many areas you can cut, and then stash that cash away for retirement and other needs. It's no secret that debt is a killer. Credit cards provide convenience purchasing power, but those bills eventually have to be paid. Between credit cards, home mortgage, and car payments, it can often feel like you're working to pay down debt. One of the smartest things you can do is to focus on eliminating debt from your life. We encourage you to cut spending in other areas and apply that money to pay down debt in order to be as close to debt-free as possible. Try to imagine a world in which you got to keep the majority of the money you make. For most of us, that would be like getting a huge raise. Once you've established your budget and are able to see where you're squandering money, make the decision to invest in a strong financial future. The best strategy is to first pay off high-interest credit cards, then auto payments, and then your home mortgage. You cannot begin to imagine how liberating the experience of eliminating debt from your life will feel. Financial emergencies tend to pop up when you're least expecting them. After all, that's why they are called emergencies. Perhaps your car breaks down, a tree falls on your house, or someone breaks a leg or needs emergency surgery. These kinds of events often come out of nowhere and can be financially devastating. Having even a few thousand dollars allotted for repair costs or doctor visits can provide tremendous peace of mind. If you're interested in other sources of money for financial emergencies, be sure to read this article. Most people have very busy lives. After a hectic and exhausting day at work or school, it's much easier to eat out than to make dinner at home. This is also a source of unnecessary spending. The simple reality is that eating meals out is expensive. It might feel convenient at the moment, but it takes a major bite out of your budget. Do yourself a huge favor by buying groceries and eating meals at home. This will help save money that you can apply to other needs like paying down debt. You'll thank yourself in the long run. There's no denying that buying new stuff is fun. We all love getting new clothes, electronic gadgets, going out on the town during the weekend, seeing movies, and indulging in other costly activities. But again, these types of spending habits cut deeply into your budget. It's hard to save for the future when you're spending today. When it comes to spending habits, small changes can have a significant impact. Such as packing a lunch for work rather than eating out, or staying home for family time rather than going out for dinner and a movie. Habits are just that...they're habits. When you learn to change your priorities, you'll soon discover that your quality of life will improve as well. Everyone loves going on vacation. Yet when funds are limited, it can be hard to justify taking a trip. This is why we recommend factoring in vacation expenses into your monthly budget. Setting aside a little money each week will add up in the long wrong. Instead of buying a candy bar when cravings hit during the afternoon at work, put a dollar in your vacation jar. You'll be pleasantly surprised how small savings can add up over the course of the year. Creating a family budget doesn't have to be complicated. It's actually easier than most people imagine. The key is to sit down with a paper and pen and to be honest about your financial resources and learn to spend money wisely. Click here to see budget-friendly home improvement tips and tricks.